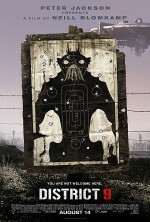 C+ - The lusciously realized science fiction setting of District 9 almost compensates for the film's slack qualities. Eschewing deep space wonders, director Neill Blomkamp brings his extraterrestrials into the dusty, militarized locale of modern South Africa. The first twenty minutes of District 9 constitute its most lively and gratifying stretch, as Blomkamp lithely blends faux footage from news programs, documentaries, security cameras, and other sources to set up his tale. However, what starts out as a gripping, blackly comic work evolves into a wearying slog, with the film reverting to the obnoxious chase-escape-chase rhythm of countless action films. (It's telling that a COPS-style ride-along early in the film is its best sequence.) The film's visual flourishes are arresting and often witty, from the swirl of flickering symbols within an alien cockpit, to the sight of giant insects in castoff human clothing. Such pleasures, however, aren't worth the surrounding ballast. The attempts to analogize the alien "prawns" with real-world refugees are clumsy and illogical. The story depends on a protagonist who acts head-slappingly stupid with irksome consistency, and doesn't evoke the sympathy that Blomkamp imagines he does. Most disappointingly, District 9 eventually succumbs to unfortunately typical scifi tedium.